After the usual minor difficulties involving directions, the team assembled at Old Deer Park in Richmond for a return fixture against Salix C.C. With heavy cloud and the threat of rain the game was reduced to 35 overs a side, and in the usual manner captain Al Dickenson lost the toss and the Whalers were asked to field. A series of half chances were disappointing spilled as Salix began to accelerate in the middle of the innings, one of their batsmen making 55. Osgood (1-16) and Clipsham (1-33)bowled well, but Salix kept the scoreboard moving. The most exciting fielding was saved until the last over. Off the penultimate ball the batsmen slogged out towards deep midwicket. 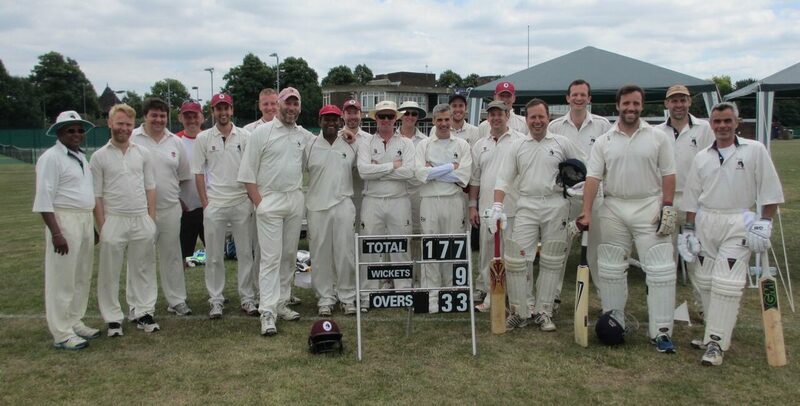 2 runs looked on the cards as debutant Piers Morgan ambled in off the boundary. However as they started for the second run, Morgan unleashed and with one stump to aim at scored a direct hit at the bowlers end running the batsmen out by a yard. More incident was to come off the final ball as the batsmen again pulled towards the on side, this time picking expertly picking out Paul Mildon at midwicket, who held a smart chance. The glory of taking a catch off the captain’s bowling (2-24) was somewhat dissipated by the realisation that in taking the chance he had cut open his hand, and a swift excursion http://www.cialispharmaciefr24.com/cialis-vasodilatateur/ to hospital in a flash car (Thanks to Claire) was required to get the necessary stitches. Set a testing 157 to win the Whalers started brightly after the early loss of Bayne with Osgood and Morgan keeping the score ticking over guiding us to 32-1. Unfortunately the middle order did its usual disappearing act and amidst a flurry of umpiring decisions the Whalers were soon 7 down with only Nelson and Hogg making double figures. Lowen batting at 9 held the ship afloat with some attacking strokes, and the Whalers needed 40 off the last 4 overs. An unlikely victory looked possible as this was reduced to 20 off 2. The heroic Mildon returned from hospital to bat at 11, but he has out with 9 balls remaining leaving Lowen high and dry on 44 not out. It was honours even this year against Salix, with a win apiece, a record the Whalers will be looking to improve on next year, although whether Mr Nelson will be featuring seemed to depend on his other half who informed him in the bar that he wasn’t going to be allowed to play again. Until next week anyway.